« Weekend Reading: Bear Market You Say? 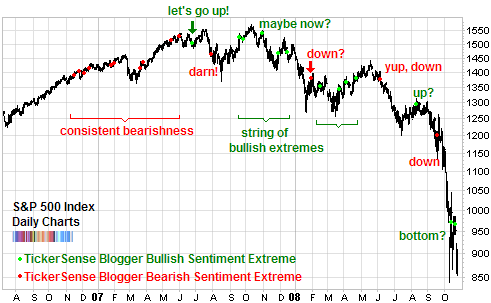 A reader asked that I revisit my dismissal of Ticker Sense’s blogger sentiment poll so here’s a chart to see if we can once and for all decide if this has any value to analysis of stock market sentiment. For an example of extreme optimism: recently, on October 13th, 2008 there were 75% bulls, zero bears and 25% neutral. While a good example of pessimism was on March 12th, 2007 with only 13.16% bulls, 42.11% bears and 44.74% neutral. The first thing you notice is just how erratic this sentiment measure is. Although bloggers are asked: “What is your outlook on the U.S. stock market for the next 30 days?” they seem to be ready to change their minds from one extreme to the next at the drop of a hat. Another characteristic is that while they put in a continuous string of bearish extremes in late 2006 and into mid 2007, they often jump from one extreme to the other and back. Their conclusion is what I said last year, Ticker Sense blogger sentiment poll provides no edge. Right off the top of my head I can think of a few reasons for this indicator’s lack of value. The sample size is extremely small (20 bloggers) and it gets smaller since only a fraction participate each week. Second, bloggers may be watching their own sentiment and adjusting accordingly. They are after all, a pretty savvy bunch and sentiment indicators and contrarian analysis is not unknown to them. This might explain why they swing from one extreme to the next at times. Third, they may be reacting to what has happened rather than what may happen. According to the study done by CXO 11% of the sentiment can be explained by the market’s behavior. So there is a mix of reactiveness and proactiveness which may muddle things. In the end though, it doesn’t really matter why, the data speaks for itself. Ticker Sense’s sentiment poll provides no edge whatsoever. That’s why I’ll continue to ignore it, except to point out from time to time when it does go to extremes and garners attention… that it should be ignored. Thanks Declan, you really drilled down there into the data! great work. I remember reading the original analysis that you did actually but forgot about it when I wrote the above. So do you see any edge there? any way this can be used, even if we dissect it or use a portion of it? I doubt it but I’m curious what you think. The only blogger really to emerge with some credibility was Daily Dose of Optimism. 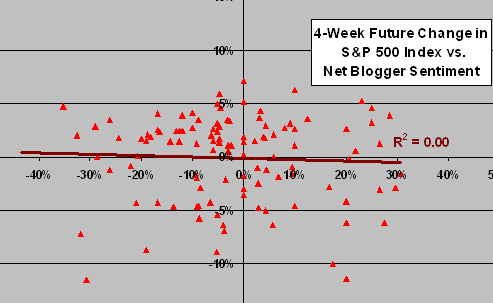 Over four seperate periods his predictions did remarkably well with the exception of his Oct 07 - Mar 08 performance (but who did well then anyway other than say Tim Sykes!). He did not resort to blanket calls one way or the other so there was an effort made to make the best call possible. Others (including myself) were generally split with good and bad periods - but no edge. And then there were good bloggers with ‘bad calls’ (e.g. Information Arbitrage). I’ll keep monitoring as long as Biryini run the polls.